When determining if someone meets criteria for ADHD we focus on what a person is struggling with and what isn’t working for them. For people with ADHD, the symptoms are significant and interfere with their ability to function. The symptoms of ADHD don’t generally enhance self-esteem or make someone feel on top of the world. Oftentimes, people with ADHD suffer from self-esteem issues; repeatedly feeling like a failure or feeling shame for struggling with seemingly simple tasks. Self-doubt and feelings of inadequacy can follow. So how is it possible that there are benefits of ADHD? I know you may be skeptical, but there ARE positive traits of ADHD! 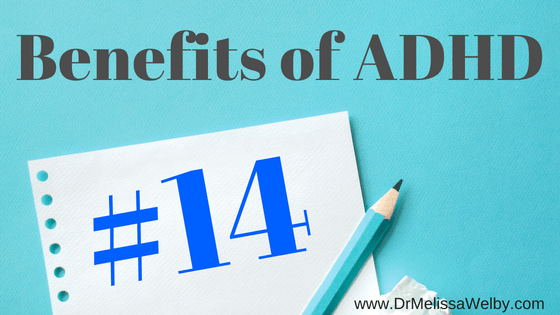 Let me tell you about 14 ADHD benefits. Keep in mind, the diagnosis of ADHD doesn’t happen when people have trouble concentrating or make careless mistakes….sometimes. No, we all do that! ADHD greatly impacts many facets of life: school, friendships, relationships, jobs. It is not just an occasional “off” day. ADHD is a developmental brain disorder as real as dyslexia and autism. Once diagnosed with ADHD, the focus can shift from what isn’t working and onto enhancing strengths and harnessing positive solutions. The key is leveraging these strengths to overcome challenges. The positive traits of ADHD can help balance out some of the challenges. What positive traits of ADHD do you have? Identifying your strengths is the first step to being able to enhance them. What are your strengths? Hopefully reading this list will help give you more ideas. Overcoming challenges takes resilience and perseveration and people with ADHD have had plenty of practice pushing past setbacks and picking themselves up when they fall. Pain is unpleasant but can lead to great things like mental resilience. Resilience is a key trait for mental well-being and is one of the major ADHD benefits. Out-of-the-box thinkers that have increased idea generation; people with ADHD can come up with creative solutions that others may not see. They can bring energy and new approaches to their projects, and be a continual source of new ideas, methods, and strategies. Lack of focus can mean there is more chance to be aware of changes in your surroundings that others may miss. People without ADHD may filter out what is going on around them assuming it is not important and inadvertently miss information that is relevant. A person with ADHD may be the first to pick up on these subtle shifts. People with ADHD are used to trying something and having to change directions to find a different way to make it work; adopting new strategies when other strategies aren’t working. Most schools don’t play to the strengths of a person with ADHD so they have had to be adaptive and creative with learning from a young age. Adaptability is one of the major benefits of ADHD. Emotions tend to be strong and straightforward. This tendency to share how one is feeling can help process feelings quickly and move forward. Sure, sometimes a person with ADHD may have to do some damage control if an emotion is blurted out in a way that isn’t “interpersonally effective”. But at least the information is put out there to work with and process. Yes, impulsivity can be a challenge but it can also be an asset and one of the positive traits of ADHD. People with ADHD tend to look at potential gains rather than getting paralyzed weighing pros/cons. They can be more willing to take risks. Quick reactions can lead to positive actions. Using humor is a great tool to cope with difficult situations. People with ADHD have gotten plenty of practice with this and can be feisty, funny, quick thinkers. Having experienced challenges in life can lead to a greater understanding of other’s challenges. This breeds kindness towards others, warmth, empathy, and a sense of humility. People with ADHD can be expert multitaskers. Doing and thinking multiple things comes naturally to someone with ADHD. Those with a skill for juggling may gravitate toward and thrive in careers with a lively environment full of multitasking. Spontaneity can lead to new discoveries. People with ADHD can have an adventurous spirit and courageous determination to explore. If hyperfocus can be effectively channeled, all the attention and energy can flow into work and a person’s passions. A major benefit of ADHD is being ambitious and driven to change the world when they find work that aligns with their interest and strengths. They have an endless desire to try new ideas, tasks, and projects. Their interests are varied and they like to seek out novel experiences. When a person with ADHD finds their passion they can be highly enthused, eager, enthralled and give lots of energy to developing it further. Their enthusiasm can energize those around them and motivate others. People with ADHD often don’t hold back on what they are thinking. They can be outspoken with their thoughts and often present themselves authentically and honestly. I know there are many challenges that go along with ADHD. This list isn’t meant to minimize those challenges but to remind everyone that there are important strengths too! 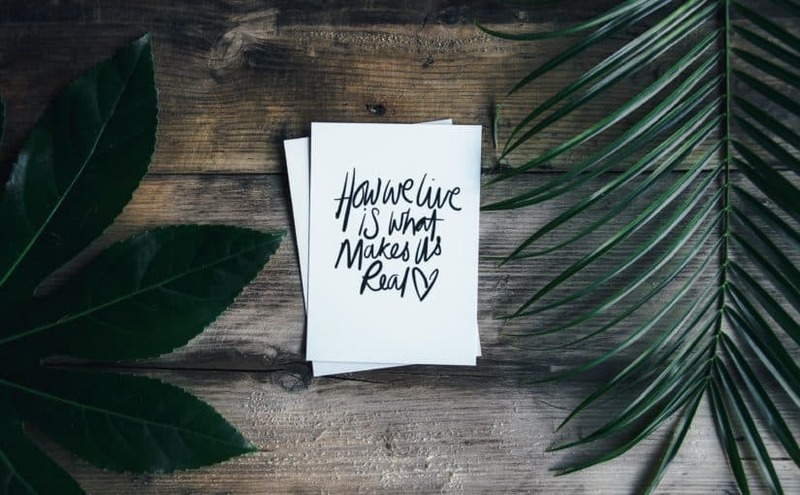 When optimizing mental health it is important to not only focus on what isn’t working and how you want it to be different but to celebrate what goes well and enhance the strengths that exist. What strengths do you identify with? Which ones would you add to the list? Let’s make this list longer so it is easier for others to recognize the positive traits of ADHD. Need help staying on track? Sign up for a year of monthly prompts that will help you focus on your goals, assess what is going well, and decide what may need tweeking. I was diagnosed at age 54, explains a lot of my struggles all my life – appreciate the reminder of the gifts, too. Dr. Barry Prizant says something similar about autism. Work with the strengths, maximize ability, rather than focusing on the disability. That helped me re-frame the issue when my grandson was diagnosed. I saw so much potential and it is being realized in his life already. Good advice to apply to any life challenges. Love this “Work with the strengths, maximize ability, rather than focusing on the disability”. Thanks for sharing! Wonderful article! I too was diagnosed in my 50’s and had known I was “different” my whole life. I know it’s not in a bad way, just different. I appreciate your list and the focus it puts on the positives, rather than the negatives of ADHD. I love this article! ,this is what I needed to hear today. Thank you! Glad you will benefit from it! Absolutely loved reading about possitive in stead of always hearing about negatives!